It’s high school football season. I miss high school football season. I mean I miss being part of the high school football season. The only thing I am doing these days is checking how the Centennial Titans are doing weekly. That’s because Alex went to the Frisco Centennial High. Alex started high school as a member of both the Titans football team and the Titans band. That was a tough schedule. He pretty much had to make a choice between the two, but did not want to disappoint his friends and coaches in either team. I remember he was struggling for a while to make a decision, and one day coming back from a prolonged practice afternoon with both teams, he was deeply troubled. That was the first time I saw Alex needed help in handling school affairs. We had a little chat. I asked him what he thought was the best thing to do for himself. He said he wanted to focus on the band. I volunteered to go with him to see his football head coach. And we did. The coach was supportive. I could see the sense of relief from Alex. It turned out to be the right decision. 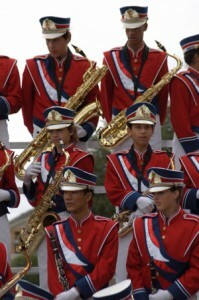 Alex flourished and excelled in the band. He became a drum major in his senior year. The Titan Band won many regional, state, and national awards. I made sure I was in those competitions as much as I could. I enjoyed every performance. But the real excitements came from the Friday night football games. The kids were certainly into it. The fans – parents – were even more into it. All the yelling, shouting, cheering made the evening that much fun! Then here came the half time show. That was when I felt even more proud. Sometime, our football team was over powered (this is a very young high school). Then you would hear one of the parents saying: “Our band will beat ya!” It was in those games that I felt the strong family and community bonds. I know high school football has over a hundred years of history. But this kind experience was brand new to me. In all my school years, rarely the parents got involved in any extra curricular activities (if there were any those activities). As I sat there with other parents cheering in those games and performances, I could sense how much more the boys and girls enjoyed themselves, because they knew that on top of bringing the best to their school, they always have their loved ones behind them. Win or loose aside, they wanted to do their best to make themselves proud, and to make their folks proud. I have been following the Cowboys for some time now, and I am also attached to my UW Badgers and Alex’s Longhorns (I admit that I am more attached to the Badgers). But only by going to the high school games could one understand the deep roots of football and the love to the game in this country. This entry was posted on Wednesday, September 30th, 2009 at 9:12 am	and is filed under Journey of life. You can follow any responses to this entry through the RSS 2.0 feed. You can leave a response, or trackback from your own site.